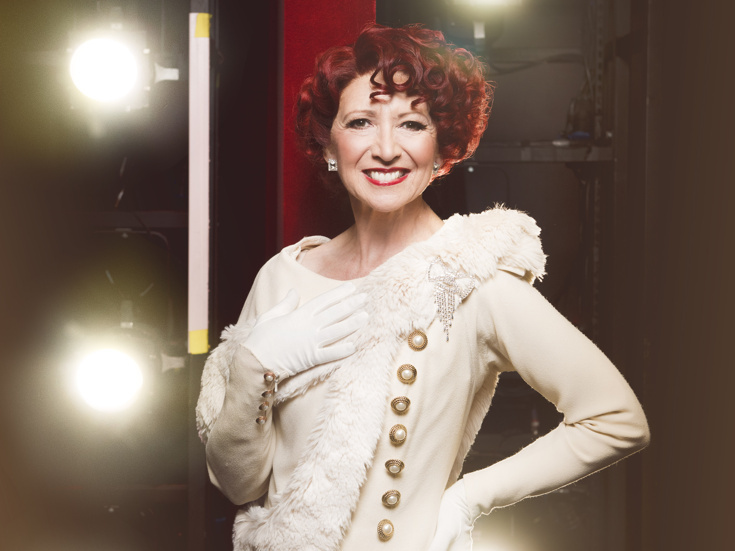 Bonnie Langford in a promo shot for "42nd Street"
Bonnie Langford, acclaimed star of stage and screen, will join the cast of the celebrated London production of 42nd Street as Dorothy Brock beginning on September 3, 2018. Langford will remain with the cast at Theatre Royal Drury Lane through the conclusion of the show's run on January 5, 2019. Langford's West End credits include Gypsy, Chicago and the original London production of Cats. She has been seen on Broadway in Chicago and Gypsy and on-screen in EastEnders and Doctor Who. The cast of 42nd Street also includes Tom Lister as Julian Marsh, Clare Halse as Peggy Sawyer, Ashley Day as Billy Lawlor, Jasna Ivir as Maggie Jones, Graeme Henderson as Andy Lee, Christopher Howell as Bert Barry, Bruce Montague as Abner Dillon, Mark McKerracher as Mac/Doc/Thug, Emma Caffrey as Anytime Annie and Matthew Goodgame as Pat Denning. The London staging of 42nd Street is directed by the show's co-author Mark Bramble and choreographed by four-time Tony nominee Randy Skinner. The musical features a book by Bramble and Michael Stewart, music by Harry Warren and lyrics by Al Dubin.